Dr. McDade is our 5-star-rated orthodontic specialist for Invisalign Teen in Oxnard, CA, Camarillo, CA, and Santa Barbara, CA. 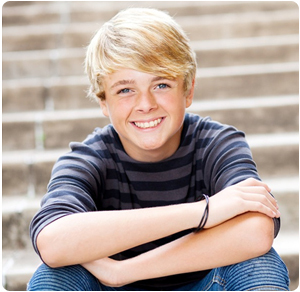 Let Invisalign Teen help bring your teenage dreams alive! As an orthodontic treatment option, Invisalign Teen uses clear aligners that are removable and virtually undetectable. You can straighten your teeth without your friends and loved ones ever knowing. Enjoy eating and drinking whatever you want. Also, get ready to brush and floss as normal with these aligners, because they are removable. The best part is there are no brackets or wire to cause mouth abrasions! By using its advanced technology, Invisalign Teen can treat an array of dental and orthodontic conditions, which in the past were typically treated with traditional metal braces. On top of everything, Invisalign Teen is comfortable and very durable. Schedule your appointment to see if Invisalign Teen is right for you or your child! Schedule Your Free, No-Obligation Smile Consultation With Our Orthodontic Specialist for Invisalign Teen in Oxnard, CA, Camarillo, CA or Santa Barbara, CA, Today! Join the over 10,000 happy smiles transformed at McDade Orthodontics! Call 805.485.3200 to schedule your free, no-obligation smile consultation with our 5-star-rated orthodontic specialist for Invisalign Teen in Oxnard, CA, Camarillo, CA or Santa Barbara, CA. To request your consultation online, click here.